BRIDGTON — A new peer recovery center for people affected by substance use disorder will open its doors on the Bridgton Hospital campus in September. The center is located at 25 Hospital Drive, at the back of the old hospital building that is also home to the internal medicine department. Catherine Clough-Bell, the new center’s CEO who also leads Crooked River Counseling, emphasized that the support provided at the recovery center will be peer-driven and not clinical in nature. The center will offer a variety of group meetings, including Narcotics Anonymous, Alcoholics Anonymous, family support groups, men’s and women’s groups, and substance abuse education. There will also be recreational activities such as movie nights, hiking and nature walks, yoga and painting. The center has a Foosball table as well. Memberships to the center will be free, though there will be an application process for people to join. In order to be a members, Clough-Bell said people must either self-identify as a person in recovery, as an active user who wants to learn more about recovery, or a family member of someone in recovery or struggling with addiction. “There are no fees for the center,” Clough-Bell stressed, though there could be small costs involved when participating in fun events like pizza night, for example. The new center is one of several being created across the state as the result of a 2016 state law requiring the Maine Department of Health and Human Services to create peer recovery centers. The Bridgton center will receive funding through its DHHS contract. Clough-Bell said the opportunity was first identified by the Lakes Region Substance Abuse Coalition. Both Clough-Bell and Martin stressed that while center is located on the Bridgton Hospital campus and connected to several other groups, it is its own separate entity. Clough-Bell said the group does work “closely with the medical profession” and is collaborating with existing peer-to-peer recovery centers in Portland and Bangor. “We really hope to be their little sister” Martin added about the Portland Recovery Community Center. The Lakes Region center also features a computer lab, and will provide resume workshops and list job posting for its members. Along with Clough-Bell and Martin, the center has one other part-time staffer specializing in communications. The rest of the work will be done by volunteers. Martin estimated they’ve received about 40 membership applications so far. Martin said there is “so much energy, so much anticipation” behind the center. “The Bridgton community has been incredibly welcoming, not only to Crooked River Counseling, not only to physicians who proscribe medication-assisted treatment, but to the Lakes Region Substance Abuse Coalition and to the center,” Clough-Bell said. Clough-Bell said that state officials have been “really responsive” in the process of getting the center up and running. The Lakes Region Recovery Center open house will be held Thursday, Sept. 6, from 5 to 7 p.m. at the center at the back of Hospital Drive. CEO Catherine Clough-Bell, right, and Director Tracey Martin are looking forward to opening the Lakes Region Recovery Center in Bridgton. 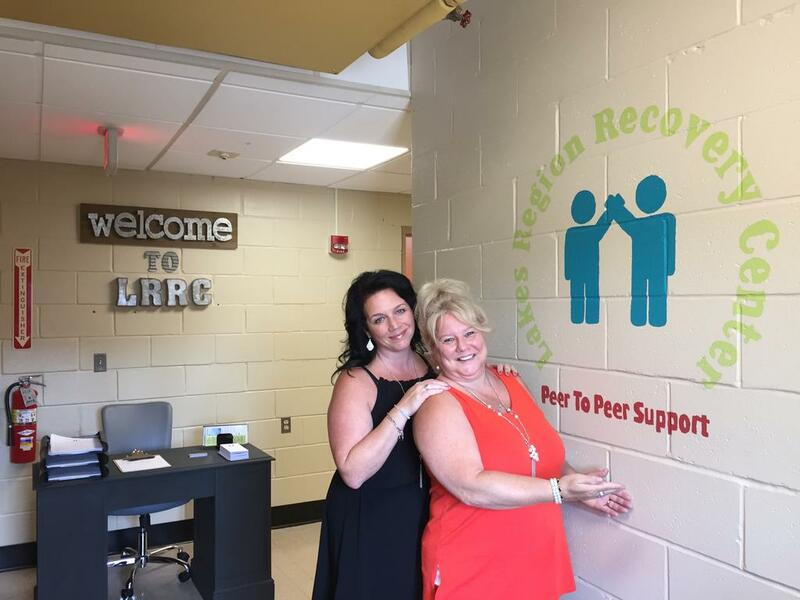 CEO Catherine Clough-Bell, left, and Director Tracey Martin stand in the group room at the new Lakes Region Recovery Center in Bridgton, which opens in September.